Trump asserted that Hillary would increase Syrian refugee admissions "by 550%" -- and yes, the current figure is 10,000 refugees and Hillary proposes an increase to 65,000, which is indeed 550%. Trump asserted that "I did disagree with Ronald Reagan very strongly on trade; nobody does it right." Indeed, Trump has consistently opposed U.S. trade deals for as far back as we have records: in his 2015 book, in his 2011 book, 2000 book, and in 1999 commentary prior to any political aspirations. Trump asserted that "Iran, who we made very powerful--we gave them $1.7 billion in cash. I mean, cash. Bundles of cash as big as this stage." Indeed, cash shipments to Iran in that amount, including a planeload of actual cash, were part of the Iran-nuclear deal. Trump has been heavily "fact-checked" in the previous debates�including OnTheIssues fact-checking--and the fact-checkers worked heavily on this debate too--but this time Trump cited figures and cited them accurately, perhaps because the fact-checkers were so harsh in the past. When Hillary asserted that Trump supported the Iraq invasion, Trump interrupted by saying "Wrong" but offering no other explanation. Trump's offhanded support of the Iraq invasion was much better justified by Mike Pence in the V.P. debate, saying that Trump was not a "polished politician " with his offhand support. Trump should have expanded on that, but instead just repeated "Wrong." When asked if he would "accept the result of this election," Trump responded, "I'll keep you in suspense." His response seemed honest, but Hillary called it "horrifying" and the mainstream media has spent days focusing on this statement. Trump could have prepared for this question by citing Al Gore, who contested his presidential race unsuccessfully, and Al Franken, who contested his Senate race successfully, or numerous other legitimate "suspense" situations. 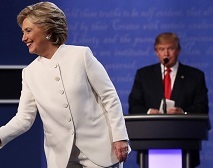 Regarding nuclear competition, Hillary accused Trump of telling Japan and South Korea, "go ahead, enjoy yourselves, folks"--implying that Trump would break our alliances � Trump's response failed to explain that he meant that Japan and South Korea should contribute to their own defense�something Hillary disagrees with, but a legitimate policy stance that Trump should have explained to millions of viewers. Those sorts of missed opportunities are the mark of an inexperienced politician who did not prepare for the emotional strain of live attacks and live response. The way experienced politicians prepare -- presumably the way Hillary prepared � is to practice being attacked so you can be heard in your response. I'll tell an anecdote of how that worked once when I was on one of those "talking head" TV shows debating against a seasoned political opponent. I told my son when to watch and he watched with his mom--my ex-wife and not a political fan. At the end of the TV show, my ex-wife called me to say, "Your opponent was a party regular and a pro but you tore her to shreds � how did you do that?" I responded, "I just said the same thing I'd said a dozen times before." I had been on a dozen TV and radio shows just like that one, talking about the same topic with a dozen other opponents, and honing my arguments. You know how you say after a tough situation, "Oh, I should have said X" Well, in politics, you get to say X the next time around � because the topics repeat over and over. And each time you say the same thing again, you say it a little better � to a different audience each time (and, if your politics are working, to a larger audience each time). So when my ex-wife saw me on TV, she was impressed because she was hearing the 5th or 13th or 20th versions of my responses, with the mistakes removed over time. My ex-wife didn't hear the first dozen versions, with lots of mistakes � she thought my TV response was natural and spontaneous, because I had prepared so many times that I could sound natural and spontaneous in front of a large audience. Trump had an audience of many millions for the final debate. He did SOME preparation � but he needed to practice debating with an attacker who asked him tough, annoying, half-truth questions. Then he could have made his mistakes to smaller audiences, and given a practiced reply to Hillary � THAT is the preparation that Trump lacked. Donald Trump: Overturn Roe v, Wade and return abortion laws to the states. Donald Trump: Not acceptable to rip baby from womb in 9th month. Hillary Clinton: Defunding Planned Parenthood hurts women cancer screening. Hillary Clinton: Government shouldn't be involved with late-term decisions. Hillary Clinton: Late-term decisions are most painful; leave government out. Donald Trump: Economic machine to increase US growth rate to 5% or 6%. Donald Trump: We're dying at 1% GDP growth; we don't make things anymore. Hillary Clinton: Don't add a penny to the national debt. Hillary Clinton: Make economy work for everyone, not just the powerful. Hillary Clinton: Free college education for families make less than $125000. Hillary Clinton: I have 30 years of experience helping kids and families. Donald Trump: Condemn Russian & any country's involvement in our elections. Hillary Clinton: Clinton Foundation raised $30M to help Haiti. Donald Trump: I disagreed with Ronald Reagan on trade; we need better. Hillary Clinton: I fought illegal dumping of Chinese steel and aluminum. Evan McMullin: Consistent conservative in favor of free trade. Donald Trump: There are millions who should not be registered to vote. Hillary Clinton: We need Supreme Court to stand up to the powerful. Hillary Clinton: Unprecedented Russian interference in presidential election. Donald Trump: We need Supreme Court to stand up for the 2nd Amendment. Hillary Clinton: I believe in 2nd amendment but 33,000 people died from guns. Donald Trump: ObamaCare collapses under its own weight if we don't repeal. Hillary Clinton: If you are on no-fly list, you shouldn't have a gun. Donald Trump: Amnesty is unfair to people waiting on line for years. Donald Trump: We have some bad hombres here; I'll get them out. Hillary Clinton: Ripping families apart would rip our country apart. Hillary Clinton: Vet immigrants; ask Muslim-Americans to help us. Hillary Clinton: Focus on deporting violent criminals & path to citizenship. Donald Trump: Debunked women fictionalized stories about sexual harassment. Donald Trump: Electing Hillary means four more years of Obama. Donald Trump: Hillary & Obama criminally paid people to start riots. Gary Johnson: Only third-party candidate on the ballot in all 50 states. Evan McMullin: In statistical 3-way tie for electoral votes in Utah. Hillary Clinton: Replenish the Trust Fund by raising the cap. Hillary Clinton: I will not add taxes on anyone earning under $250,000. Donald Trump: If we overthrow Assad, we could end up with worse than Assad. Donald Trump: We need element of surprise; stop saying where we'll attack. Donald Trump: Iran is taking over Iraq. Hillary Clinton: No US troops as occupying force in Iraq. Hillary Clinton: Benefits of no-fly zone against ISIS outweigh risks. The above quotations are from Third Presidential Debate, Oct. 19, 2016, moderated by Fox News' Chris Wallace.